George King will face former club Warrington Wolves this eveing. PIC: Allan McKenzie/SWpix.com. Wakefield Trinity return to Belle Vue tonight looking to pick up their second home win of the Super League season. High-flying Warrington Wolves are the visitors as they look to extend their winning run to three games. Below, we have broke down all the information you need ahead of tonight's round seven Super League clash. Wakefield have won just one of the last five meetings with Warrington. Chris Chester's side were 26-12 victors when the sides met in July 2017. Bill Tupou was forced off against Hull FC last Friday. PIC: Matthew Merrick. The Wolves have won the last three meetings, however, and have been victorious in eight of the last 10 matches in all competitions. In the Super League era, Wakefield have won 16 games against the Wolves while Warrington have triumphed 29 times over Wakefield. Trinity's biggest win over tonight's opponents came in a 50-10 victory in 2002. Their heaviest defeat occurred in 2015 as they were beaten 80-0 by last year's Grand Finalists. Ben Westwood has been suspended for tonight's clash. PIC: Anna Gowthorpe/SWpix.com. 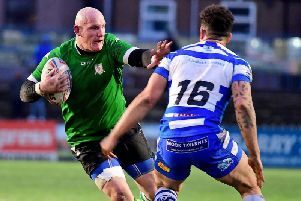 Wakefield have won three and lost three of their first six games in 2019. After defeats against London Broncos and St Helens, Trinity were triumphant against Catalans Dragons and Leeds Rhinos. A surprise loss at home to Hull KR followed but Chester's men returned to winning ways last week with a 32-12 win at Hull FC. Warrington have lost just once in 2019 and sit second in the table, behind undefeated St Helens. The Wire secured three consecutive wins against Leeds Rhinos, Hull KR and Huddersfield Giants at the start of the campaign. They suffered a narrow 23-22 defeat at Catalans Dragons in round four but have since won their last two games, beating Castleford Tigers and Wigan Warriors at the Haliwell Jones Stadium. Wakefield have four players on their long-term injury list following the news that Tom Johnstone will miss the rest of the season with a ruptured ACL. He joins Tyler Randell, Craig Huby and James Batchelor on the sidelines. Bill Tupou is also unavailable after coming off injured against Hull last Friday but should be in contention for the visit of Salford Red Devils next week. Danny Kirmond is suspended meaning, George King, Max Jowitt, Jordan Baldwinson and Keegan Hirst have been drafted into Trinity's 19-man squad. King moved from Warrington to Wakefield at the end of last season and could face brother Toby who has been included in Warrington's 19-man squad. Head coach Steve Price has made just one change from his squad from last week's win over Wigan. Harvey Livett has been named in place of the suspended Ben Westwood. The veteran forward has been banned for four matches after being found guilty of Grade D headbutting. Tonight's clash will be shown live on Sky Sports Arena from 7pm. The game is scheduled to kick off at 7.45pm. Alternatively, tickets are still available for the fixture at Belle Vue, for more information visit the club website. Warrington are 4/11 favourites with title sponsors Betfred for this evening's game. Wakefield are priced more handsomely at 9/4. The draw is 22/1. Trinity are priced at 5/6 with a +10 handicap while the Wire are 11/10 with a -10 handicap. Stefan Ratchford and Daryl Clark are joint 6/1 favourites to open the scoring. 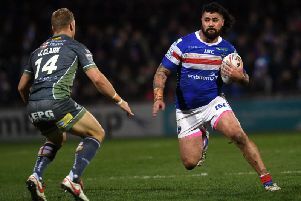 Danny Brough is 8/1 to score first while David Fifita is priced at 25/1. You can still pick up your official Wakefield Trinity matchday programme 'The Dreadnought' in last Friday's Wakefield Express.